I think the best way to do this is to cut straight to the chase. 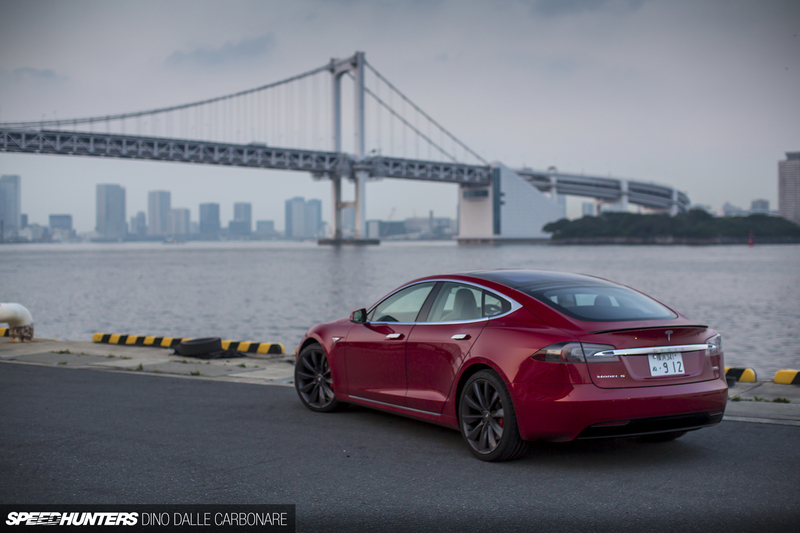 What the hell is an electric car doing on Speedhunters? We, the purveyors of performance in its purest form driving what is being referred to as the future!? This isn’t the future we are interested, right? We want the future to be about lighter cars as composites materials become the norm; we want good old fashioned combustion engines mated to slick and precise manual transmissions. That said however, we still need cars that function as daily modes of transportation. In a perfect world we would all drive to work in Super GT race cars and set lap times on the way there so that we can try and break them the next day. But commutes are not like that. For daily driving you need a car that does a lot of things well, and it helps if it comes with enough excitement to make even the dullest of journeys interesting. Such a vehicle exists, and it’s called the Tesla Model S.
This is not the first time I have driven a P90; I had one for a day about two years ago when I was doing a story for Motor Head magazine. As eye-opening and as interesting as I found that car, I didn’t think it warranted a story on Speedhunters.com. 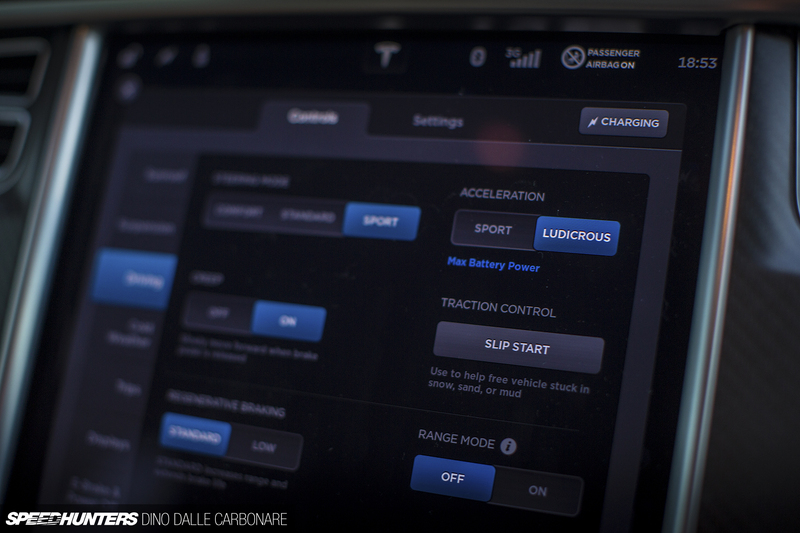 This all-new and refreshed Model S P90D does however, and it’s all thanks to something called ‘Ludicrous’ mode. I’ve seen all the hype about how the twin motor version of this car performs, especially with the fastest acceleration mode engaged. The sheer number of videos floating around on social feeds is staggering, and it was actually getting to the point of being annoying. That was until I tried it for myself. 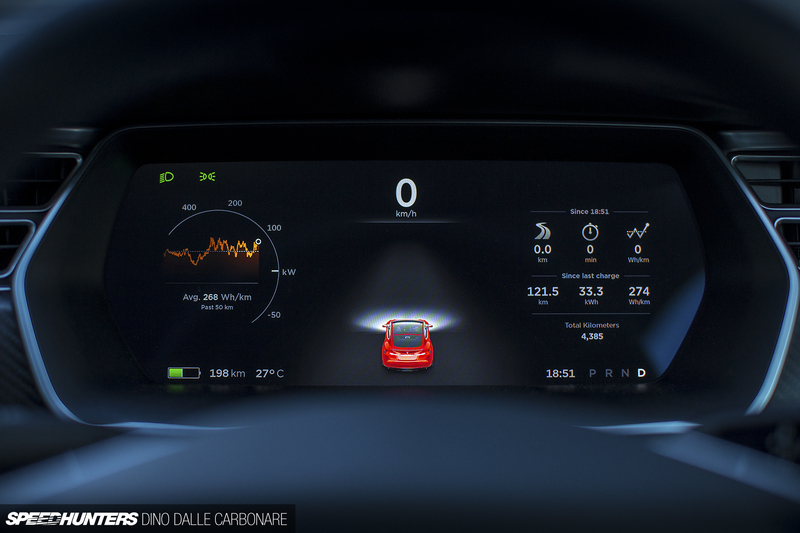 If this is what the future of motoring looks like, I’m in! Sure, the car is heavy and it isn’t as great of a steer as a fully specced up BMW M5 or Audi RS6 would be (which are about the same money as the test car I drove in Japan), but for the way I’d use a car like this in a city like Tokyo I wouldn’t care, as 99 per cent of the driving is mundane. The P90D’s acceleration is brutal, and the more I came to grips with the instant torque delivery the more I wanted to drive it. And at the end of the day, isn’t this what we all want in a car? 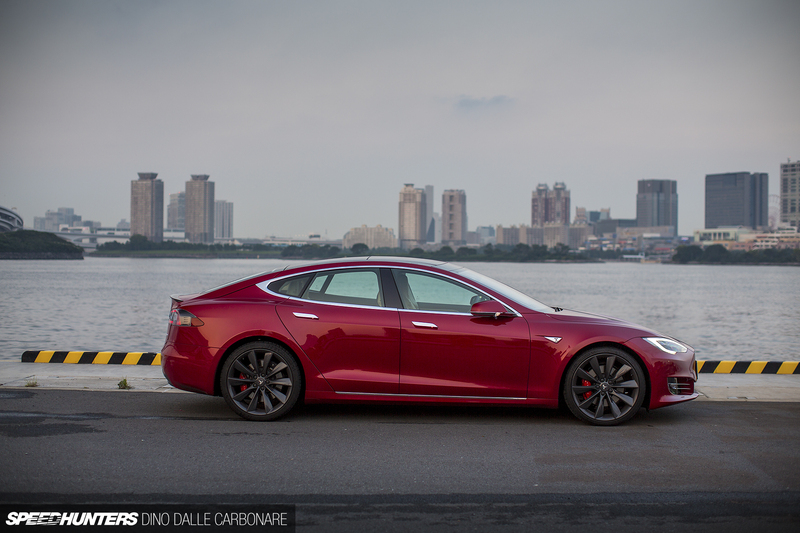 I found myself looking for excuses to drive the Model S, and that left me feeling conflicted. 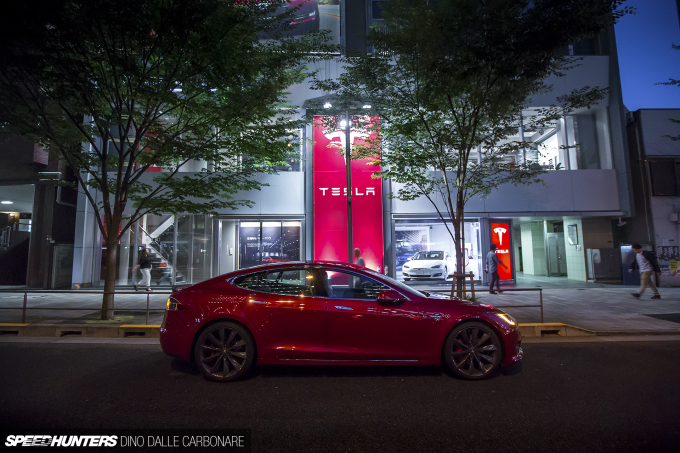 After all, electric cars have no soul or character, right? They’re like an android that does everything so well and efficiently, yet lack the most important traits that would make them human. Is a car like the P90D the automotive equivalent of an android? I was torn, I didn’t know what to think any more. I just wanted to drive it more and feel the rush of acceleration. I wanted to lower the windows and hear all four tyres generate the grip needed to effortlessly catapult me down the road. 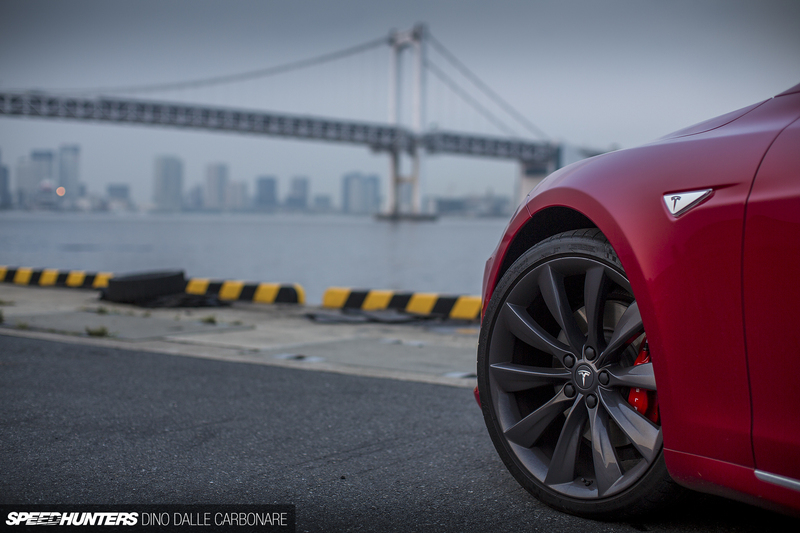 Yes, that’s right – in an electric car you actually get to hear the tyres do their thing. It’s quite bizarre but strangely satisfying at the same time. What to make of the P90D’s looks, though? 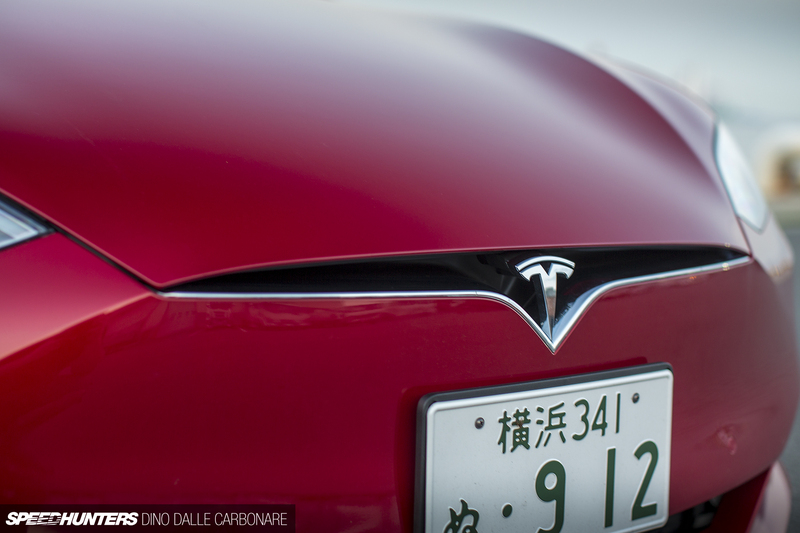 The Model S has been around for some years now and has a pretty flowing and eye-pleasing shape. Here it’s been restyled with a new front bumper and grill treatment to make it a little more like the bigger Model X. This will have to do for the foreseeable future as Tesla concentrates on the X and the much anticipated 3, which its collected a staggering number of pre-orders for, not to mention fight off the competition from big premium German manufacturers like BMW, Porsche and Audi as they get on and ramp up their electric car offerings. For now however, the Model S seems to be enjoying a monopoly-like grasp on the premium EV sector. It offers an impressive package with very impressive range, a big cabin, seating for 5+2 and an image that early adopters can’t get enough of. There’s a catch though: all this comes with a pretty hefty price tag. 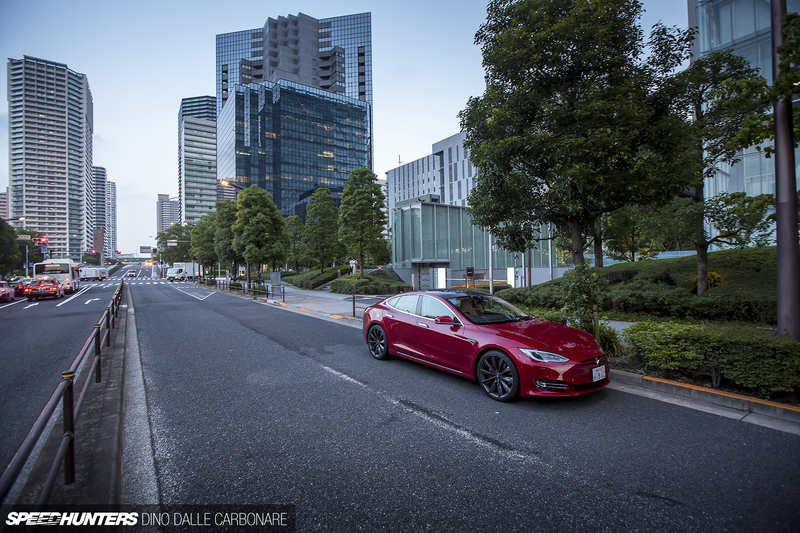 The car I was driving had a few extra options and ran the equivalent of US $160,000 in Japan. That’s a big number, regardless of the type of car you’re talking about. But affordability isn’t the point here, that’s something the Model 3 will address. What I want to talk about is that despite the naysayers and the instant dismissal from petrolheads, electric cars can be fun and exciting. They just deliver the grin-factor in a different way. 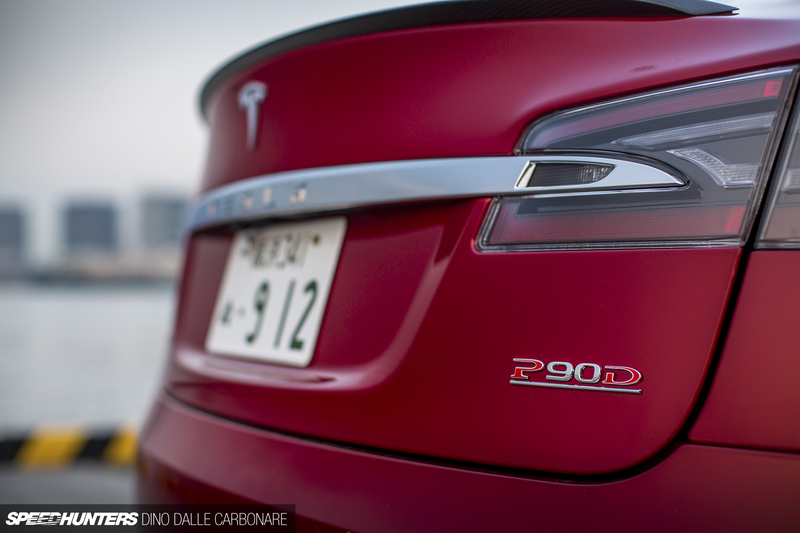 The ‘D’ in P90D is a reference to Dual, as in dual motors, meaning that there is a smaller electric motor in between the front wheels giving AWD to the Model S. We all know the benefits all-wheel drive can bring in highly powerful cars. What I like about Tesla is the way it doesn’t make a big deal out of the fact that its cars are electric. 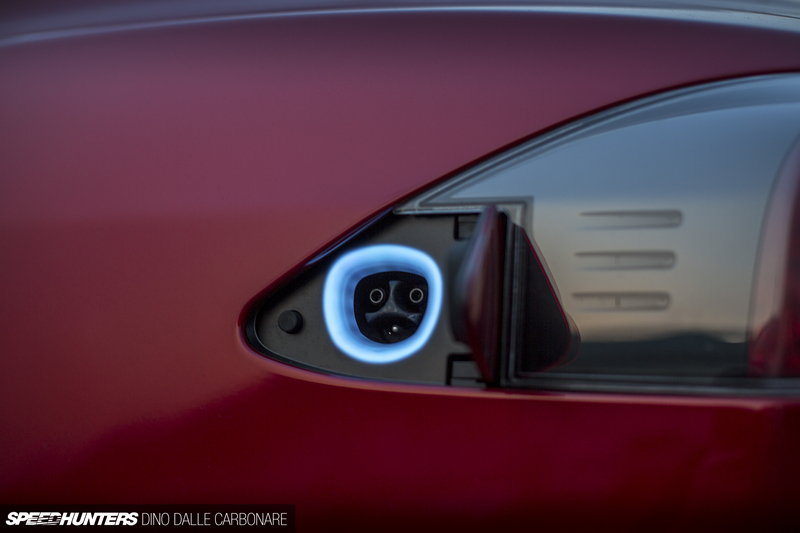 The designers even went as far as to stealthily incorporate the charge port into the side of the taillight. 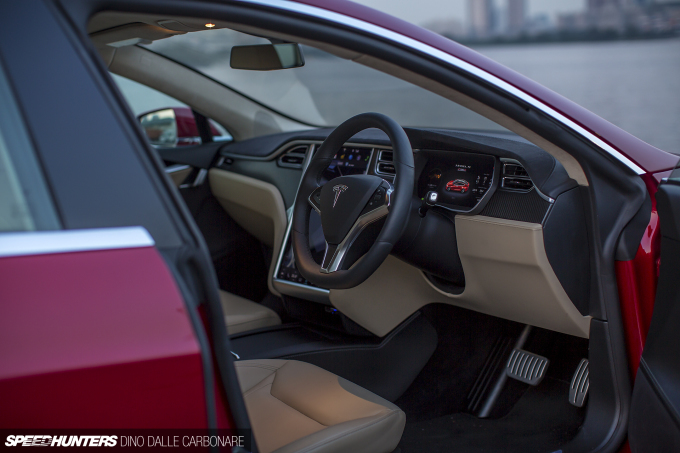 The P90D’s cabin is spacious and well appointed, if only lacking a little character. But that’s probably down to the fact that Tesla is concentrating on minimalism rather than over-designing details and features just to stand out. After all, the gigantic vertical center touch screen is as unique and individual as it can get. 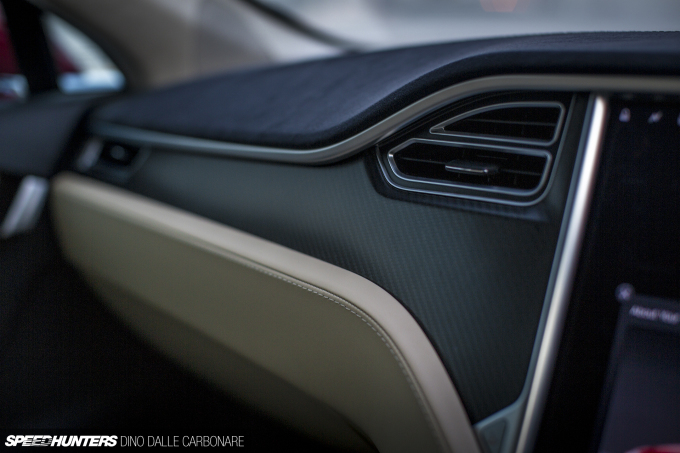 I’d love to see more colour options in the trim, but aside from that the P90D delivers a very nice interior. The seats are supportive, but I did find it strange that there are no roof-mounted grab handles included, front or back. It’s a curious omission, especially seeing how fast this car is. The optional satin-finished carbon accents on the dash are a nice detail. 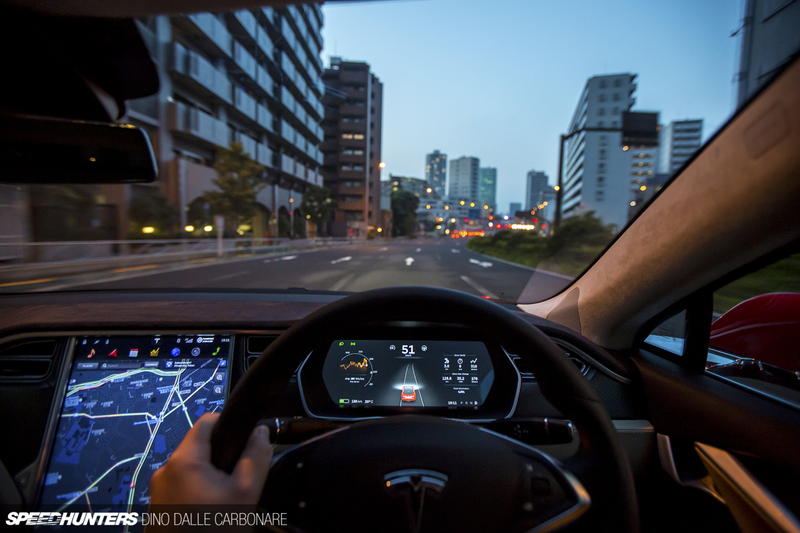 Once you learn how to read it, the LCD main dash layout offers a wealth of information, and you really do feel like you are driving some crazy futuristic concept car. And that’s a feeling I liked; I get why people fork out big money to get a taste for this type of thing. It’s different; it gets your juices flowing for different reasons. And the ‘Ludicrous’ acceleration setting is a huge part of it all. 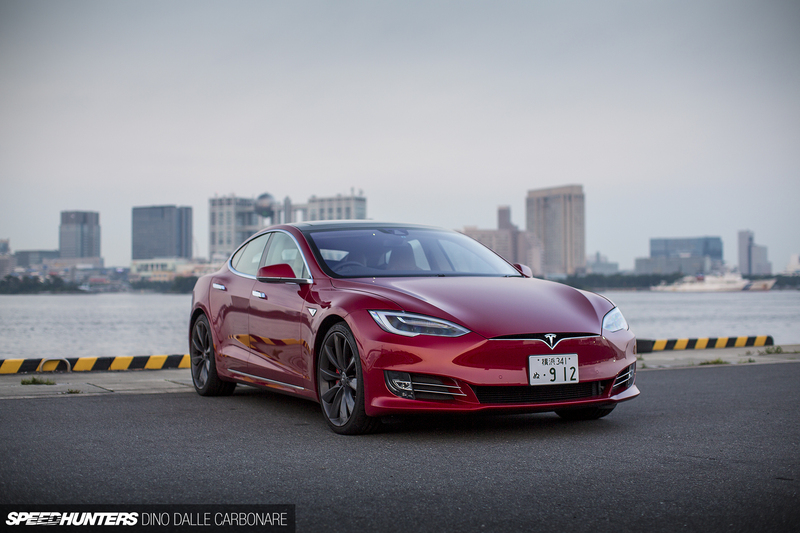 The characteristics of electric motors is what makes this car so much fun, and you can’t help but dive deep into its monumental reserves of torque. You want it all and you want it now, which is exactly how it’s delivered. One prod of the accelerator redefines ‘instant’ acceleration. It makes any, and I do mean any, combustion engine equipped car feel broken in comparison. There is just no way a conventional piston engine can muster up such urgency, so quickly. During my time with the Tesla, I decided to do an experiment with my little resident mini Speedhunter, who at the tender age of two and a half has had the fortune of riding in a number of fast cars. He knows what’s up, and he was loving the P90D. See his reaction? See how he wants more? Well, I was the same. That sums up the Model S P90D’s driving experience to me. So no, electric cars haven’t been sent to earth from hell to destroy all we enthusiasts love and cherish about cars. They can be just as fun, but in a different way. In a huge metropolis like Tokyo, which has embraced EVs in a way no other city in the world has yet, it makes even more sense. All that needs to happen now is for this sort of thing to become affordable. I'm friends with someone who has a 2013 Mode S P65, and let me say that the acceleration is in all honesty, indescribable. This is the best I've seen it explained. When I first rode in it, the sheer force of the acceleration not only threw me back into my seat (obviously) but also gave me a headache, the thing you get doing taxes or arguing with your girlfriend. Personally I think the cause of it was either my eye being pushed back into my head, or my brain snapping in half. Or a combination of the two. The only thing I'd change about the car is the way the center console slopes down toward te floorboard rather than meeting the bottom of the touch screen, but other than that, it's simply perfect. It'd be even better parked in my garage next to a 2017 GT-R. I'm just as excited about electric motorcycles. I will always love the mechanical symphony but the simplicity, reliability, acceleration of electric bikes is simply fantastic. The future. A world of touchscreens but still no jetpack in sight. I read once that the most awful, heartbreaking thing in the world would be to grow up and try to explain to your six-year-old self why you became an accountant instead of Superman, and why being awesome just wasn't "realistic" or "practical." The earlier version of you won't care about any of that, he'll just be crushed by disappointment. The future we actually got - compared to what we were supposed to get - is like that for me. The technology that underlies this car is a consolation prize compared to the fusion reactors, flying cars, rocketships, mile-high skyscrapers, laser rifles and jetpacks we were supposed to have by now. High Tech used to be magical, and the future was going to be awesome. Now, High Tech is ubiquitous and the bloom is very much off the rose. Somewhere along the line, I discovered that I'd rather watch movies about the future than actually live there. I've always loved the idea of an electric car. Ever since the first time I drove a golf cart and slid it around a corner I've wanted to build a small fun ev toy to play with. Imagine the savings on an ev drift car, or really any motorsport for that matter, when this becomes more affordable. I love my dinosaur burning fire spitting tire killing machines, but besides the fact that it makes no noise I can definitely dig it. The only thing I really love about this article is the video. Adorable af. But I still didn´t came in terms with this as the "future". I am probably sulking. It's not electric cars that have been sent to destroy us, just Elon Musk's personality. But he and his team seem to know what they're doing. just from the video, it looks incomprehensibly quick. 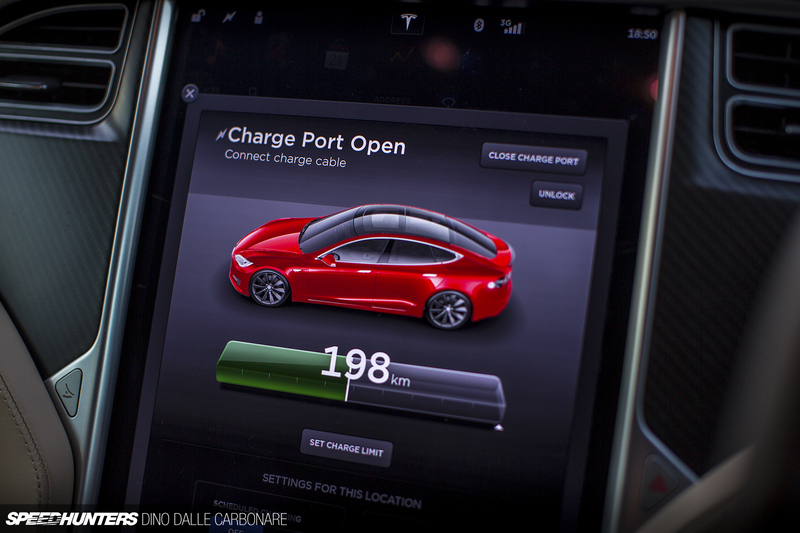 The interface, the styling, it all gives off more of a gadget vibe than a car vibe, and I think that may be the point. But regardless of how good it is, there's no way I'm going to walk into a Tesla dealership and ask for the "D". No reason electric cannot be fun. Didn't Taniguchi do a drift demo run in a Tesla at Tokyo Auto Salon a few years ago? Need some HANS System on when driving that car lol, how many languages does Luca speak already? Ben Chandler haha he was loving it! FrankensteinConnelly Haha so true, he was really blown away with it. I had a 991 C4S after it and he was not amused. Makes you think! Not gonna lie, that video was pretty cute. For me at least. 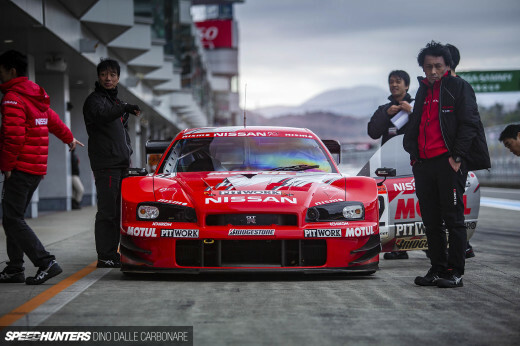 speedhunters_dino I hear you, but what if they ban our oily, noisy things altogether in the future? What will we do then? And who said electric cars were boring?? You guys are such sellouts. Change the name to Adhunters! Ice Age Have you been in one? So is this better than a lambo? 2, 1, GO!!!! Damn your son is the future Speedhunter! speedhunters_dino JakubVenhuda I saw you mention this a several times, that there isn´t very much young people coming to meets anymore. You guys should someone come see Slovakia. If anything, the number of young people that are into cars is rising. Most of them are stock older sport cars or not so well done projects, but the passion is here. You won´t see any decline of young petrolheads here. Honestly it needs some sort of sound when it goes, right now its no different than a golf cart. Make it sound like the millenium falcon and Ill be interested. 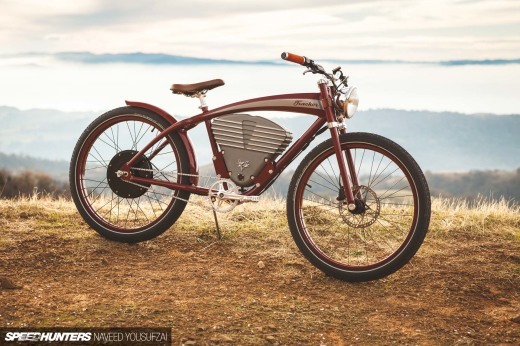 Teslas are alright, but personally I can't wait 'til battery packs get small enough that it's practical to swap an EV drive train into an older chassis. Cool article Mr DC, thank you. Until they become more accessible and practical I'll be happy driving my Evo X. @Nate I quite enjoyed sneaking up behind people, just to mess with them as for some reason Japanese people love to walk in the middle of backstreets and do so like they have no fear of getting ran over. I really like the Tesla ! its design is great to look at and the reaction from your son shows how fun they can be ! think of going fast but making no noise and attracting no attention ! Wait, no Oh Sh*t/Grandma handle bars? What else will I grab onto when I'm sitting shotgun in this and the driver decides to floor it at a traffic light? What else will my grandma grab onto when she claims I'm driving too fast when I'm actually driving at a modest speed under the speed limit? @Nate There's a niche market: make custom sound profiles for electric cars! Great vid and nice, honest review Dino. I think your boy needs to be a key part of any/all of your videos! As in, "The Porsche GT3 RS: Does it baby?" 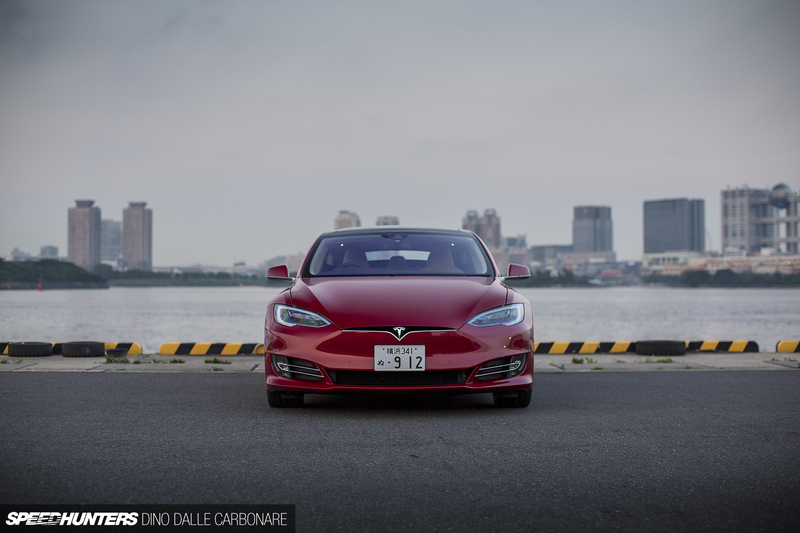 speedhunters_dino I am young and very much into cars and it is a bit frightening to see European countries setting up years to when give up on fossil fuel cars. All the new cars are a bit dull in my opinion. Manual gearboxes are getting rarer. New cars only have automatics and the worst of them all, CVT. Even a lot of the new sports cars fall to this. Prizes of the newer cars are astronomical if you want anything faster than 1.3 liter city commuter. Around here anything new enough to probably not be touched by increasing regulations show no sign of becoming affordable. It is very hard to work and mod newer cars, as those are getting more and more complex with useless gizmos. Owning a older car is being made harder all the time through incresed tax rates. Everything is skyrocketing in price. The future of this hobby is only for richer people. Poorer people have no place there. And yeah, I find that electric cars lack a soul. Idk why, probably because all the automation that is taking away the control from the driver. I also have a feeling that BRZ/GT86 is going to be one of the last somewhat affordable true enthusiast car on the market, and the used ones are not going to drop on price here in long, long time. I was thinking more of a grassroots aftermarket with parts for the home wrencher. I guess we won't see much of that until Teslas have been around long enough to drop in value on the second hand market. D1RGE EXE Haha that wouldn't be too hard to do as I take him on quite a few of my shoots. He liked the 991.2 C4S I will have a story on soon, but was not impressed that it was way slower than a Tesla! LouisYio Yeah I don't get why. I really thought that was something manufacturers had to put in certain cars but I guess not. The movie does it for me! I love the kid's reaction :p ; says it all. 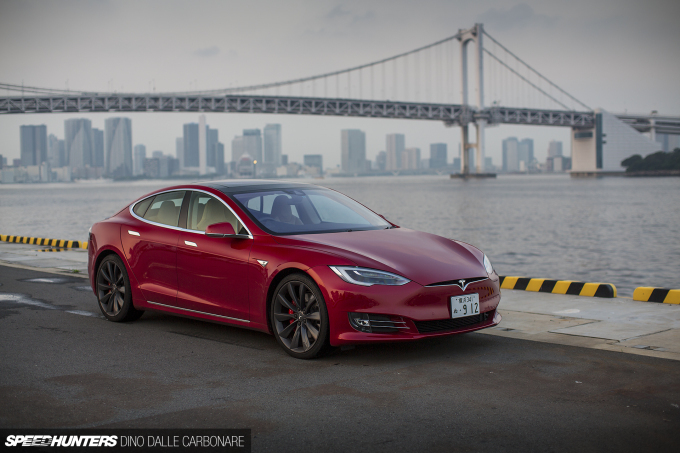 I don't like the design of this Tesla though… Kinda ugly actually, especially the front end. tarik_tjs well all I can say is to go out and drive one, any EV car. I had a BMW i3 last year for a period of time and it really won me over. For city use these cars make so much sense. At that price is better include Luca to tell me when to go Ludicrous. Let's take the Aventador (assuming you've driven one) Would you pick the N/A V12's glorious "Engine music" or the electric motor's "Insta-Torque"? Boooo, the old front bumper cover was much better looking than this new front facia. No_Chance speedhunters_dino Dude cvt's can be better in every single way for performance. 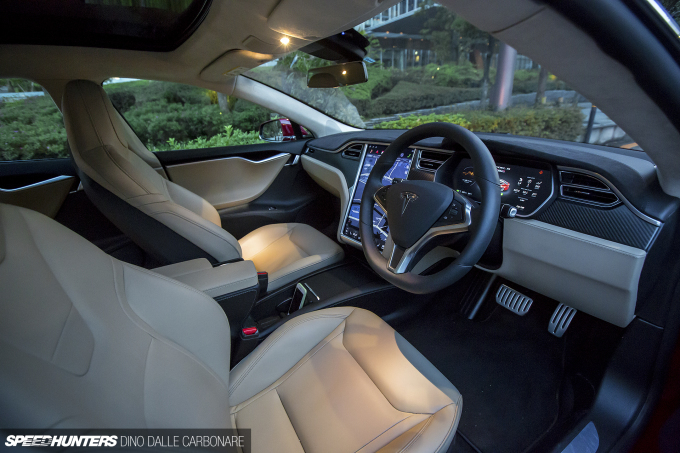 I like the Model-S, but why can't they have better seats? Look at the BMW 5-series comfort seat package for example. Musk is such a prick, though, and I only ever hear about this car from people that have zero knowledge or interest in cars trying to force a "hey isn't this cool, you like cars don't you think this is cool?" based on the fact they disapprove of my hobby and interests and are trying to "encourage" me toward something they approve of based on their personal values, prejudices, and generalisations that they rationalise with some kind of skewed moral epistemology. Having said that I am not opposed to electric cars at all - working sometimes in London, the electric buses, taxis, and vans are way overdue with the majority of these still being diesel. Electric vehicles will make a huge difference to air quality in cities, and noise. the wildest thing about these cars, is as much as the styling doesn't bark at you - when you are passed by one - you certainly notice it - and saying that is odd, because you essentially don't hear it coming! it's such a conundrum - you want to demand traditional engine sounds - at the benefit of what? because you are used to the noise? then we expect electric cars to be so different, that they need to look different, and yet, the design is so normal, that it's noticed for being normal!